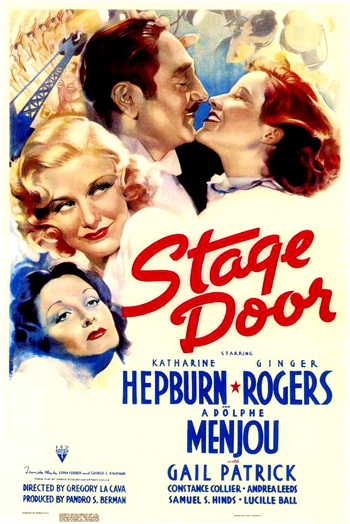 The backstage comedy features snappy dialogue and acting from some of RKO's greatest female stars - Katharine Hepburn and Ginger Rogers (in her first serious actress role without Astaire), and other up-and-coming actresses such as Lucille Ball, Eve Arden, Gail Patrick and Ann Miller (a 17 year old, underage actress who secured the part with a fake birth certificate). With much of the film's action occurring within a theatrical boarding house (the Footlights Club) for young, star-struck, vulnerable ingenues and debutantes, it is filled with bitchy and sassy, and stage-struck young women - who laugh and heckle each other, shed tears, express their hopes, dreams and aspirations, spout wisecracks, barbs, and insults, and genuine, heartfelt words of experience. The adapted film's witty and funny screenplay, with crisp and crackling ensemble pieces, was written by Morrie Ryskind and Anthony Veiller, and was loosely based upon the Broadway stage play of the same name, written by George S. Kaufman and Edna Ferber. The hit theatrical version starred Margaret Sullavan (in the Hepburn role), Phyllis Brooks (in the Rogers role) and Frances Fuller (in the Andrea Leeds part). The film received four Academy Award nominations (without Oscars) for Best Picture (or Production), Best Director, Best Screenplay, and Best Supporting Actress (Andrea Leeds). Surprisingly, neither Hepburn or Rogers received an acting nomination. After the credits, the camera views the outside of a brownstone building in New York, and moves down to focus on the structure's plaque which reads: Footlights Club. It is a seedy Manhattan theatrical boarding house filled with young, out-of-work, Broadway-aspiring actresses. The living room inside is crowded with talkative young ladies, either playing the piano, lounging around, or complaining to the maid Hattie (Phyllis Kennedy) who is singing an awful-sounding aria while sweeping up broken glass. Come on, take 'em off...You heard what I said. Take off those stockings or I will and take a little of the hide along with it...If you think I'm going to give up my lunch to buy you stockings, you're mistaken...From now on, you wear your own stockings or go bare-legged. To the places you go, it doesn't make any difference anyhow. Jean: Well, the last couple we went stepping with were made of lumber, especially their feet. Jean shrewdly accepts after learning it's a dinner date: "That lamb stew's got me counting sheep at night....They can't step on you when you're sitting down...You know me, the lumberman's delight." Jean: Oh Linda, Mr. Powell's car is here. Mr. Powell isn't here, just his car. Eve: (snidely) Peaceful little haven we have here. Two other boarders enter the front door, identifying themselves as "tired Tyrolean peasants" following a poorly-attended, "folding" matinee show which was "very intimate. We had a hundred people on the stage and fifty in the audience." Jean provides advice to the newly-unemployed girls: "Let's all go on relief and get it over with." Terry: How many doors are there to this place? Terry: I only asked a simple question. Linda: If you were a little more considerate of your elders, maybe Mr. Powell would send his car for you someday...Of course, he would probably take one look at you and send you right back again, but then you have to expect that. Linda: Do you know, I think I could fix you up with Mr. Powell's chauffeur. The chauffeur has a very nice car too. Jean: Yes, but I understand Mr. Powell's chauffeur doesn't go as far in his car as Mr. Powell does. Linda: Even a chauffeur has to have an incentive. Jean: Well, you should know. Linda I hope you enjoy your lamb stew again tonight. I'll be thinking of you while I'm dining on pheasant bordelaise. Jean: (mimicking her high-brow tone) Bordelaise, no less. Whoa, girls, listen, bordelaise she says. Linda: Or maybe it's casserole, I'm not quite certain. Jean: Be sure not to eat the bones and give yourself away. Speaking to the landlady ("the person I see about accommodations"), Terry asks for a room in the "theatrical boarding house" and requests unrealistically: "I want a room with a private bath." After more laughs from the girls in the parlor, she ponders: "Is there anything strange in that request?" Mrs. Orcutt replies: "Oh you mustn't mind the girls. They're just full of fun. We're like one great big family. I may not be able to give you just what you want, but I can put you in a room with a very charming girl, temporarily, that is, until we get a vacancy." Terry pays the fee of $13 dollars a week (excluding lunch meals) for a shared room - with a crisp, $50 dollar bill. Terry's baggage is brought in from her taxi and taken upstairs to her room. As the luck of the draw would have it, she is assigned to the vacant room with Jean, now that Linda has been expelled. According to Mrs. Orcutt, a former actress herself, the front parlor of the boarding house exhibits a roped-off shrine of "the chair Bernhard sat in when she was rehearsing Queen Elizabeth over here. I was in the company." Another of the elderly boarders, an experienced actress named Catherine Luther (Constance Collier) remembers: "As a matter of fact, although it isn't generally known, Bernhard and I had the same coach." Jean: When does your baggage get here? Terry: I'm expecting the bulk of it in the morning. Jean: We could leave the trunks here and sleep in the hall. There's no use crowding the trunks. Terry: I don't know what we're going to do when the wolfhounds arrive. I hope you don't mind animals. Jean: Oh, not at all. I've roomed with a great many of them before. Terry: Yes, I can see that. Jean: (after smelling Terry's ermine wrap) Fresh kill? Terry: Yes, I trapped them myself. Jean: Do you mind if I ask a personal question? Jean: Are these trunks full of bodies? Terry: (pointing to two of the trunks) Just those, but I don't intend to unpack them. Jean: Well, I was just thinking if the room got too crowded, we could live in the trunks. Jean: Oh, that's quite all right. What a lovely dress! Whipped up at home by loving hands. Jean: Do you cook too? Terry: Nothing fancy. Just plain home-cooking. Jean: I'll bet you could boil a terrific pan of water. Terry: I see that in addition to your other charms, you have that insolence generated by an inferior upbringing. Jean: Hmm. Fancy clothes, fancy language and everything. Jean: That won't be of much use to you here - we all speak pig Latin. Terry: And I use the right knife and fork. I hope you don't mind. Jean: All you need's the knife. Judy: Did you get a load of that hat? I expected a rabbit to jump out any minute. Another girl: Yeah, I thought old Orcutt would fall over in a faint when she handed her that fifty dollars. A third girl: If she had a fifty dollar bill, what's she doing here? Eve: It must have been counterfeit. There's no such thing as a fifty dollar bill. Eve: Maybe she's a social worker doing a little slumming. Judy: Well, she picked the right place. Judy: Well, at least you know there is such an animal. What did he look like? Judy: Did he say 'Man, Man' when you squeezed him? Kaye: I didn't get that close to him. Eve: You didn't see a manager, dearie. What you saw was a mirage. The talented, out-of-work actress confides how disappointing it is to experience another fruitless day in producers' offices: "After playing a whole season in Powell's outer office, he might at least have said hello. It gets pretty discouraging once in a while but I guess it's all in the game." Because she is dirt-poor and three weeks behind on her rent at the boarding house, she forgoes meals: "I've practically been promised a part and I'm not eating any meals." Kaye: My mind's been wandering lately...Oh, it's just one of those days. Let's sit down and have a good cry...No casting today. Leave your name and telephone number and we'll get in touch with you later. Mr. Powell isn't seeing anyone until the end of the week. Last week, and the week before, and the week before that. Where did I ever get the idea that I was a good actress? Jean: Say, who got all those rave notices a year ago? Kaye: Yeah, but that was a year ago. Jean: Oh boy, you do sound gloomy. Kaye: Oh, I don't know why I'm hanging on except there's nothing else I can do and no one I can go back to, except someone I'll never go back to. Jean: Listen, you don't have to go back to anybody. You're the best actress in this whole club. Something good's bound to be coming your way. Kaye: Oh, I hope so. But it had better be soon. Kaye: (frantically) Oh, Jean, I've got to get that part in Enchanted April. It's been my whole life. It's me. No one else can play that part. It belongs to me. (She tearfully and hysterically collapses into Jean's lap) Oh Jean, I've got to get that part. Catherine: I can't tell you how interested I was in your discussion of Twelfth Night. It was so intelligent. Terry: Oh, thank you very much. I'm afraid that the rest of the inmates didn't share your enthusiasm. Terry: Oh, did you play in Twelfth Night? Catherine: Yes, I - I have a few of my notices here if you'd care to see them...Oh how lucky, they're right on top.